After 30 years of searching for a quality wood furnishings conditioner, Mississippian Jack Ramsey developed The Natchez Solution. Ramsey discovered a 1738 recipe from a Virginia pioneer that actually feeds into the grain of the wood. He studied, worked and refined this mixture into an all-natural blend of beeswax, mineral oil and lemon oil. Ramsey began test marketing his conditioner in 1983 under the name The Solution. He sent several samples to Natchez Mississippi antebellum homeowners and antique dealers because, he said, "If it worked on all that priceless furniture, we had something." The response was overwhelming. In fact, the city of Natchez was so impressed with Ramsey's product that it allowed him to add the city's official logo to his product and it became The Natchez Solution. Mr. Ramsey has since passed on but The Natchez Solution continues to be made in rural Hinds County, near Jackson Mississippi and is now available worldwide via the web site www.natchezsolution.com . Evidence of The Natchez Solution can be seen in museums, private homes, country clubs, antique shops and furniture stores throughout. 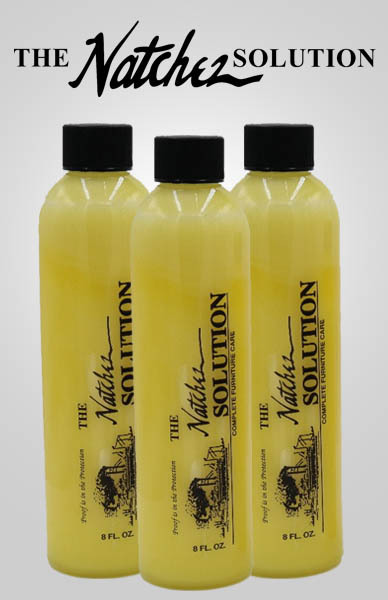 The Natchez Solution is a truly natural product which contains no silicones, alcohol, lacquers, turpentine, or detergents. It is delecately aged to perfection. It resists finger smudges and water staining as no other product of which we are aware on the market today! The Natchez Solution is a true "wood feeder" meaning that it is fed into the wood during application to the furniture. Use this product on all of your treasured wood furniture. 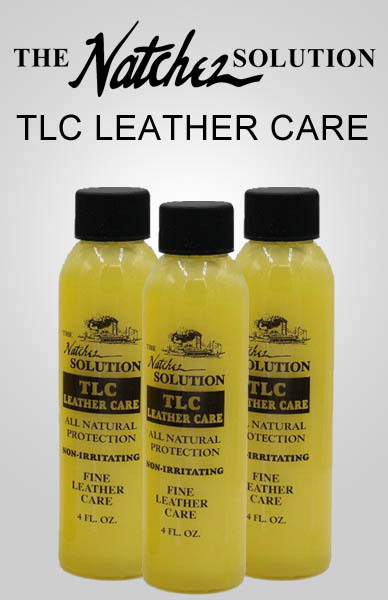 TLC-Total Leather Care from the makers of The Natchez Solution. TLC is a combination of beeswax and FDA quality mineral oil especially blended to provide protection to all leather. TLC actually feeds into the leather and restores leather's natural beauty and suppleness. TLC is hypo-allergenic so it is safe to use on horse tack that touches the animal. Rub TLC into your old softball glove, boots, saddles--any leather product. It is so safe that it can be applied by hand. TLC is made in Mississippi and comes in convenient 4 ounce bottles.